N: One fine evening I was armchair foraging with BBC3. The forager, a far superior animal than me, was roaming on the rocky shores of British Isles, picking up green strings from a wild shrub and chomping away with great pleasure. He said it was like having the sea in your mouth and I believed him just like a teenager believes that red bull gives you wings. I remembered that when I first went to Puri (a sea side resort in the state of Orissa in India), I could smell the salty fishy sea long before I saw the huge waves lashing on the beaches. I imagined that this sea side shrub would absorb all that smell during its lifetime and would indeed taste like the sea. In a few months time I was snooping around Borough Market (a market in Borough of Southwark where connoisseurs of money meet connoisseurs of food) exercising my will power by not eating the tempting pastries when I saw heaps of green strings – no name tags and no price tags. You are thinking that I would rush to the seller and find out if they were Samphire but a reluctance to engage possessed me and I had to walk away. My exercise in abstinence had gone beyond rescue. And then a few months on Anirban called me to say that he had bought some new vegetables to eat with Salmon and I intuitively knew that it had to be Samphire. Hangs one that gathers samphire — dreadful trade! In today’s Europe – the land of health and safety – Samphire is grown in marshes and pundits of the food world are telling us that marsh Samphire, not the rock Samphire, is the right type to eat. The food has acquired a rockstar status (forgive my pun) in recent years so much so that even the gardeners in UK are growing Samphire in pots. Those with an interest in Sitology can probably guess, Samphire is very rich in iodine. It takes only a few minutes to blanch and is an interesting accompaniment to any baked fish. Of course you do not have to be a fish eater to enjoy this vegetable. – Cut one sweet red pepper into narrow strips and a couple of garlic cloves into small pieces. – Fry in 1 tbsp of olive oil with loads of black pepper. This should take about 10 minutes. – Meanwhile start boiling some water. – Add about 120 gms of tagliatelle to the boiling water. – At about t-3 mins, where t is the time taken to cook the pasta, add about 100 gms samphire. – Drain the water and mix the pasta with the samphire and the fried garlic-sweet pepper. – Season with more black pepper if necessary. You probably will not need any salt. This is not a main dish but a crunchy and salty summer lunch that will surely remind you of your days on a sunny beach. But, if truth be told, to feel the sea in your mouth you probably still have to be a skilled forager and eat the wild thing. A: Samphire can be eaten raw or very slightly blanched. Boiling it for long can really spoil the vegetable. It is very very salty. The best way to get rid of some of the salty taste is to dip it in boiling water for 2-3 minutes as N suggests above. If you are keen to retain more of the crunchiness, you can take the samphire our from the boiling water and immediately dip it in ice water and serve cold with the rest of the dish. We have tried it as an accompaniment to baked salmon, tarbot and salt marsh lamb. It has always been a delight. 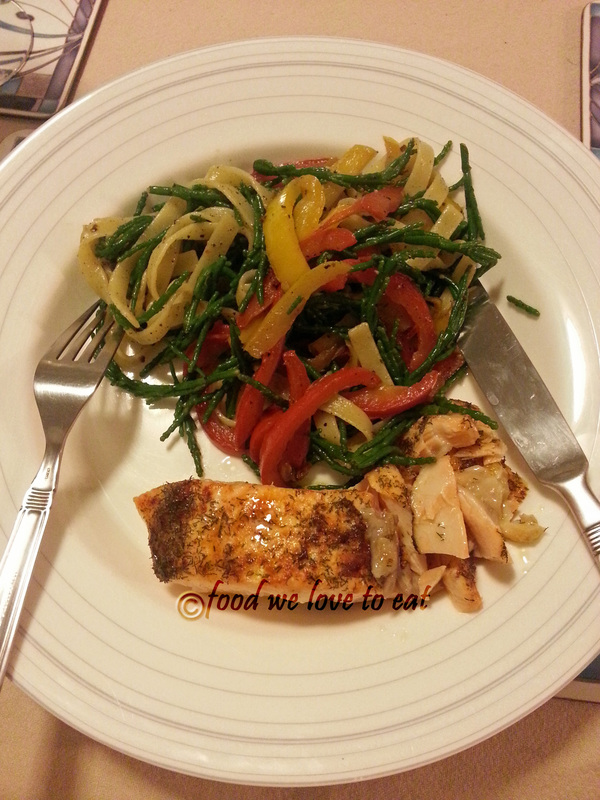 This entry was tagged iodine rich, pasta, salmon, samphire, sea food, sweet pepper, umami, vegetarian. Bookmark the permalink. I was intrigued by this green while watching one of the episodes of “One man and his Campervan” Good read, this blog N & A.